With so many edible plants and pasture-based livestock here at Red Gate Farm, we must protect our crops from pests and our poultry and livestock from local predators. Our predators include many small mammals, such as rats, skunk, woodchuck, opossum, raccoon, bobcat, fox, and coyote, as well as overhead predators such as hawks, owls, and eagles. Our area has also had random sightings of cougar and wolves. Part of having a sustainable farm is learning how to live in harmony with the wildlife--including predators--as much as possible. That's why we have Livestock Guardian Dogs. 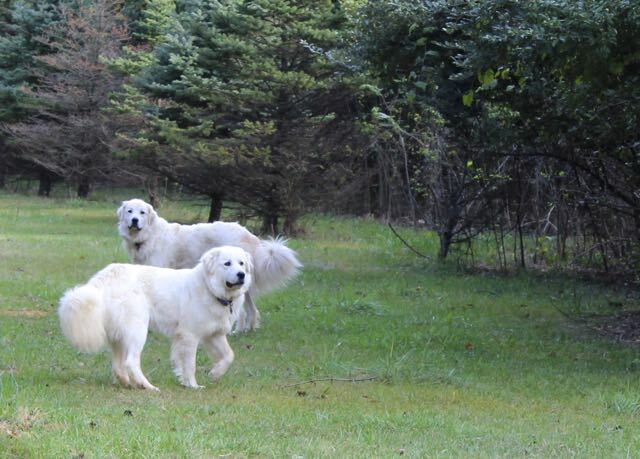 Ours are primarily Great Pyrenees, that have been carefully selected for their social temperament towards people. This makes them an excellent breed for smaller farms and homesteads, with close neighbors or frequent visitors. Our breeder dogs are also registered with the Colorado Mountain Dog Association.